Overview: Goldco Precious Metals (Goldco) is an online retailer of precious metals. Founded in 2006 by Trevor Gerszt and based out of Los Angeles, the company’s product range comprises the 2 main precious metals that are permitted by the IRS to be invested in a precious metals IRA: gold and silver. Goldco works with two companies as the custodians of its customers’ precious metals IRAs: Self Directed IRA Services Inc., a subsidiary of Horizon Bank in Texas bank with over a century of experience; as well as Equity Institutional, the industry leader in alternative investment custodial services with over $12 billion under custodial administrations. Goldco sells precious metals directly to customers; the company offers gold coins, gold bullion, gold bars, silver coins, silver bullion, and silver bars. Currently, Goldco’s client base comprises mainly individual investors. Goldco also offers the option of a self-directed IRA-LLC, which it calls the ‘Self Storage Gold IRA’ which allows a higher degree of available investments and a larger degree of portfolio control. Goldco assists it customers in setting up a Limited Liability Company which is invested in by the customers’ IRA as well as being legally distinct from the customer. In 2015, Goldco was named the Top Gold IRA Company in Los Angeles by the Los Angeles Business Journal and the #1 Gold IRA Provider in the nation by Inc. Magazine. Goldco prides itself on its customer service, providing prospective customers with all the information they need regarding precious metals IRAs as well as handling almost all aspects of the customer’s paperwork on their behalf. 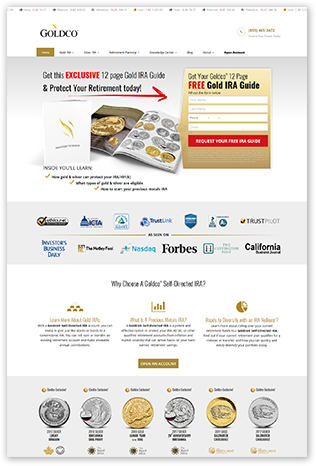 Unlike most other gold IRA companies, Goldco offers a different type of self-directed IRA, the Self Storage Gold IRA which allows its customers to set up a self-directed IRA via a LLC. Click to see how Goldco stacks up against the best gold companies! First impression is that Goldco’s website looks a little dated in terms of design, particularly when it comes to the color scheme. However, this is obviously a personal opinion that will vary based on each person’s aesthetic sensibilities. In terms of layout, the various sections on the websites are clearly delineated and there were minimal issues in terms of website navigation. Live prices for gold, silver, platinum, and palladium are clearly displayed near the top of the page right below the main menu bar. However we do note that the main page of the website uses a ‘long bottom scrolling’ format, meaning that users have to scroll quite far down in order to access some information. This is only an issue on the main page; the other subpages are fine. One thing we like about the website is the lack of pop-ups or intrusive marketing, which is an unfortunate theme in many websites today. The only constant on each subpage is a sidebar on the right giving viewers the option to download a free report; however the sidebar also contains the latest blogposts and videos, giving an informational value add just below the sell. Overall, Goldco’s website is a simple and basic design that gets the job done and conveys its value proposition without blaring it in your face. Goldco maintains three main social media presences; Facebook, Twitter, and Google Plus. While Goldco is not the largest or most prominent Gold IRA company out there nor do they have the largest product range, they have been very well reviewed (as evidenced by well over 200 reviews on TrustLink) with minimal complaints. Their focus on serving the needs of individual investors means that they are very well trusted in this niche, with most emphasizing their focus on personalized customer service. Retail investors looking to diversify their portfolio into precious metals will most likely not go wrong in choosing Goldco. Are You Still Looking For That "Great" Gold IRA Company? If you haven't found a trustworthy company just yet - don't give up - bookmark our 2018 list of precious metals firms - complete with company contact information, gold ira reviews , links to consumer protection sites and more.